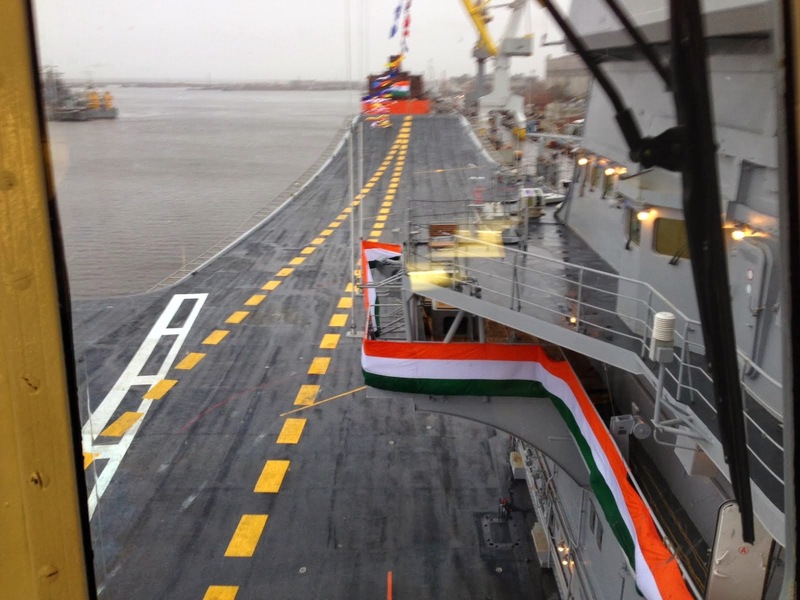 LIVEFIST: On Board The INS Vikramaditya! 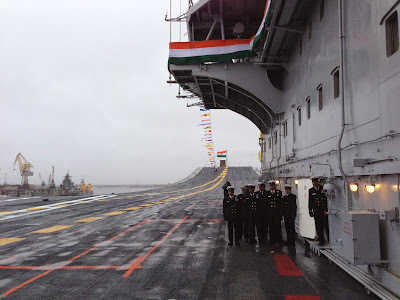 On Board The INS Vikramaditya! 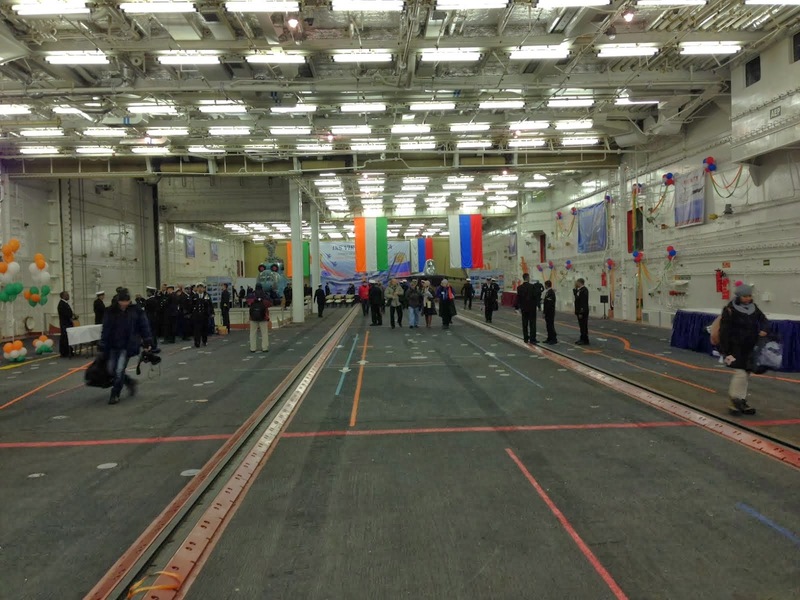 As we were driven into the Sevmash shipyard today, it was snowing lightly. Nothing to worry about. At 9AM it was still dark out, with flecks of snow like bugs in the headlights. As our mini-bus wound its way over a thin layer of snow to the jetty, it had begun to really come down. Fat snowflakes wafted down in a sharp, painful angle. 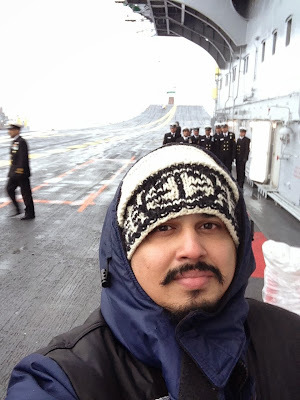 The Indian Navy lent me that parka I've got in that picture, taken a few moments after I boarded INS Vikramaditya, right before she was commissioned formally into the Indian Navy this morning. Cdr R. Gowtham, the officer who led me onto the ship, said I was the first Indian journalist to board. Nice. It has been an incredible day, dampened only by the brutal weather. -5ºC, with snow and rain, and all of it in the outdoors -- the Vikramaditya's fabulous flight deck. 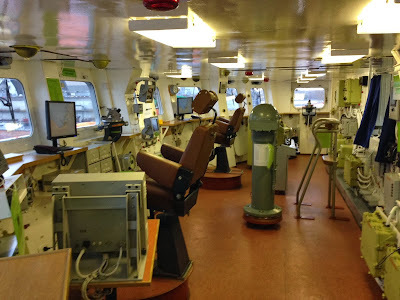 Will be posting in great detail tonight and tomorrow about the ship, what I saw and what the people on board told me. 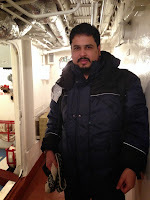 Also had a chance to chat with Vikramaditya's CO, Commodore Suraj Berry. 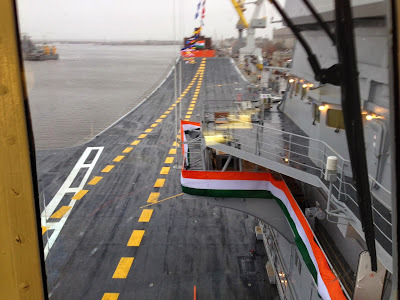 My TV reports will be on Headlines Today & Aaj Tak this evening. 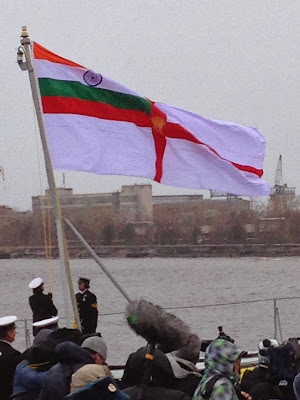 Will also be producing half-hour documentaries on the Vikramaditya in English and Hindi during the coming week on my network channels. Will post times here on the blog. 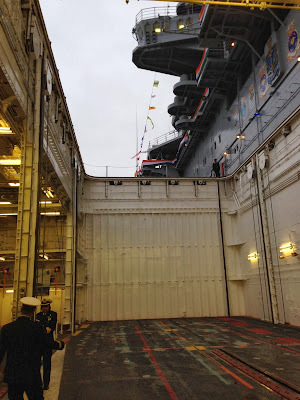 Wanted to take this opportunity to personally thank all those from the crew of Vikramaditya who helped a cold, frostbitten journalist get some work done today, and take in the beautiful new ship that's now their home (and to those officers who came over and said hi, my personal best wishes and hoping they'll send me the photos they took of us!). The Navy says it best: Shano Varuna, R33!